Mapbox will match the next €10k of donations! As I am writing this, our donation drive is just about to hit the €50k mark – we’re only €20k short of our goal now! Thank you everyone who has contributed until now. And we have super exciting news: Our friends at Mapbox have decided that they will match the next €10k of donations 1:1 – this means that for every donation someone makes, Mapbox will give the same amount again. Which effectively means that we’re only €10k away from reaching our funding goal. 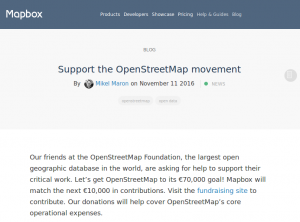 Mapbox have been a steady contributor to our donation drives, a recurring conference sponsor, and they’re also a corporate member of the OSM Foundation – and that’s not even counting non-monetary contributions like their work on the iD editor and other things in OSM. Mapbox blog entry announcing the matching donation. This entry was posted in OSMF, Uncategorized on November 11, 2016 by Frederik Ramm. Congratulations! They are doing a great job!